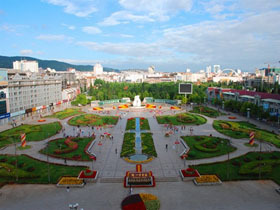 Qujing City (qǔ jìng shì 曲靖市) is located in the center of the Yunnan - Guizhou Altiplano (yún guì gāo yuán 云贵高原). It is a very important land route connecting Yunnan Province (yún nán 云南) with other parts of China, and thus has been called "the Gate to Yunnan" and "the Throat of Yunnan". The Wumeng Mountain (wū méng shān 乌蒙山) stretches for hundreds of miles, and is high in the northwest and low in the southeast. The Mountain is the watershed of the two water systems: the Yangtze River (zhǎng jiāng 长江) and the Zhujiang River (zhū jiāng 珠江). 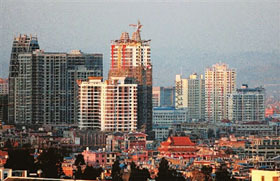 Qujing is the second largest city of Yunnan Province, with Kunming ranking the first. 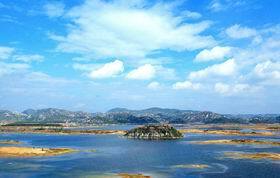 It is also an important industrial city of Yunnan. Under its administration, there are 1 district: Qilin District (qí lín qū 麒麟区), 1 county-level city: Xuanwei City (xuān wēi shì 宣威市), and 7 counties, Luliang County (lù liáng xiàn 陆良县), Huize County (huì zé xiàn 会泽县), Fuyuan County (fù yuán xiàn 富源县), Luoping County (luó píng xiàn 罗平县), Malong County (mǎ lóng xiàn 马龙县), Shizong County (shī zōng xiàn 师宗县), Zhanyi County (zhān yì xiàn 沾益县). The Five-Chi Road (wǔ chǐ dào 五尺道) in the city was the earliest pass opened during the Qin (221BC-206BC) and Han (206BC-220AD) dynasties to linking the transportation in and around Yunnan. By the western Han Dynasty (206BC-24AD), county has been established in this area. 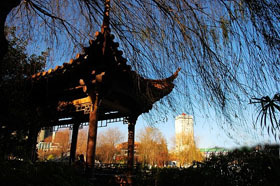 In the following five hundred years after the Western Jin Dynasty (265-316) set up prefecture to administrate the region, Qujing was always the political, economic and cultural center of Yunnan. The terrain here is mainly made up of mountains, hills and plain or basins in plateau. Karst landform also has distribution in the city. Its overall terrain declines from northeast to southwest. It has an average altitude of 2,000 meters (6,562 feet). The region enjoys a subtropical monsoon climate, and the weather is temperate and pleasurable throughout the year. The average temperature in coldest January and hottest July are respectively 14 and 19 degree centigrade (57.2 and 66.2 degree Fahrenheit). Due to the high altitude, climatic types ranging from the lower subtropic to north temperate all can be found in the city. Thanks to the temperate weather, this place is an all-year-round destination. Notable is that March to October is the period in Yunnan celebrations and festivals of ethnic minorities are densely held, and it is also the pomp season of flowers and fruits. But May to October is the rainy season in Yunnan. Umbrella and warm clothes are the prime priorities. 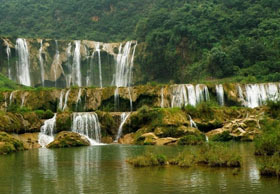 Main tourist destinations include Luoping, Luliang Colorful Sand Forest (lù liáng cǎi sè shā lín 陆良彩色沙林), the Source of Zhujiang River, Haifeng Wetland (hǎi fēng shī dì 海丰湿地), Cuan Culture and so on. Zhujiang River is the third longest river in China, with Yangtze River and Yellow River ranking the first and the second. It is also the only big river whose source can be reached and enjoyed by the common people. It is 2,214 kilometers long and its annual capacity of water is 340 billion steres. 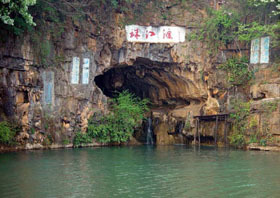 The source of the Zhujiang River has an altitude of 2,158 meters. The scenic spot covers an area of 12 square kilometers. Its surrounding wall is 17 kilometers long. The coverage of its forests reaches more than 95%. There in the scenic spot are more than 1,000 kinds of plants and such wild animals as hares, pheasants, squirrels, and so on. It is not very hot in summer and not very cold in winter. You can see flowers in bloom and hear birds singing in all of the four seasons. Wonders such as one mountain dividing up two rivers ( the South Pan River (nán pán jiāng 南盘江) and the North Pan River (běi pán jiāng 北盘江), one water running into three rivers (the South Pan River, the North Pan River, and Bullpen River), and one string through five "pearls" (lakes). Location: the east of Maxiong Mount, Zhanyi County. Transportation: every time when some festival or holiday comes, there are special tourist passenger buses of the head office of the public transportation of Qilin Region going to and coming back from the Source of Zhujiang River. In the language of the Buyi (bù yī zú 布依族) people, Lu (lǔ 鲁) means the minority of Buyi, Bu (bù 布) means the picturesque scenery, and Ge (gé 革) means the stockaded village. So Lubuge (lǔ bù gé 鲁布革) is in fact the Buyi Stockaded Village with the Picturesque Scenery. The Gorge Lake here is as long as 19.8 kilometers. 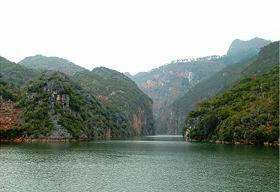 The Three Gorges are the Lion Gorge, the Drop Gorge, and the Two Elephants Gorge. If you row a boat on the lake, you will forget all the unhappiness. There are too many natural sights to see: the Dressing and Making-up Beauty, the Hanging Bamboo Shoots in the Palace of the Dragon, the Ganoderma of thousands of years, the Ancient Ficus microcarpa in the Royal Palace. Transportation: you can take the buses in the county seat of Luoping which head to the Lubuge Power Station. You can also walk along the blacktop of the Lubuge Power Station past the New Stockaded Village, the Bajiao Stockaded Village, Duoyi and the Naigesha Dam, and finally enter into the scenic spot. Tips: Watch out when touring by yachts and remember to put on life jackets. Haifeng (hǎi fēng 海峰) Wetland Nature Reserve, located at Zhanyi County, Qujing Prefecture,Yunnan Province, is a typical karst landform area. The reserve is composed of 4 wetlands including Lanshipo (lán shí pō 兰石坡), Ganhaizi (gàn hǎi zǐ 干海子), Beihaizi (bèi hǎi zǐ 背海子) and Heitanhe (hēi tān hé 黑滩河). Covering an area of 27,846 hectares. It combines of mountains, rivers, forests, stones, caves, pools as well as grasslands. Besides of stone forests, solution cavities, naturally-formed pits, large areas of swamplands, well-grown water plants and luxuriantly green hills, there are 49 species of birds in Haifeng, including migratory and resident ones. Some of the birds, such as black-necked cranes, black cranes and white cranes, have enjoyed first-class protections. These above make it a paradise for photographers. Presently, Haifeng has been listed in provincial-level reserves. Tips: 1. Tourists may follow this route: Kunming-Qujing City-Zhanyi County-Dapo (dà pō 大坡) Village 2. It costs 1.5 yuan for each to take a bus from Qujing to Zhanyi, and the route is 13 km. 3. Zhanyi is about 40 km away from Dapo. It takes approximately 2 hours. 4. The best visit time is from May to June. 5. Zhanyi-style sauteed diced chicken pieces with chilli peppers is well-known in China. Have a try. 6. Do not forget tents, sleeping bags, cameras and other travel kits. The full name of Cuan Bao Zi Stele (cuàn bǎo zǐ bēi 爨宝子碑) is the Stele of Mr. Cuan, the deceased Mighty General and the Jianning Procurator of Jin. 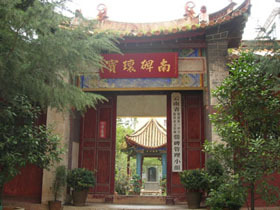 It was built in April of the fourth year of Dahen of the Eastern Jin (405 AD). It is in the regular script. The Stele is 190 centimeters long and 71 centimeters wide. There are 13 rows and each row has 30 Chinese characters. In the year 43 of Qianlong, the Stele was unearthed in Yang Qitian, which is 70 miles to the south of Qujing County (Nanning County) of Yunnan . The Cuan Bao Zi Stele and the later Cuan Long Yan Stele (cuàn lóng yán bēi 爨龙颜碑) were call the Two Cuans. Cuan Family was a big family of a minority in the south China. The epigraph provides important historical materials for the research of the minority. Location: No. 1 High School of Qujing, Qulin District. 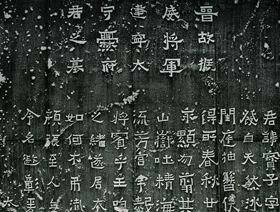 Tips: Compared with the Cuan Long Yan Stele, there are fewer characters on the Cuan Bao Zi Stele. In addition, the stele is much smaller, so later generations call the Cuan Bao Zi Stele "the Small Cuan”. The Alliance Stele of the 37 Tribes (sān shí qī bù huì méng bēi 三十七部会盟碑) is the relic of the Dali (dà lǐ 大理) Kingdom. It stands, together with the Cuan Bao Zi Stele, in the stele pavilion of the No.1 Middle School in Qujing. The Stele has been kept well. It is very small, and 1.21 meters high and 0.61 meters wide. On the top of the Stele is the inscription of the year 29 of Daoguang (dào guāng 道光) in Qing Dynasty. The first half of the epigraph is the main body and it consists of 11 rows. The second half is the part for the superscription of the official titles, and it consists of 8 rows. The style of the epigraph on the Stele is very unique. The text goes straight. You have to read from the left to the right to understand what it says. However, for the inscription on the top and the superscription on the second half of the Stele, you have to read from the right to the left. According to the ancient people, the Stele was very difficult to understand. The names of the places and people mentioned in the epigraph are still waiting for further textual research and interpretation. There are no through Flights to Qujing. However, there is the general agency of China Airline Company in the city proper of Qujing. There you can buy air tickets, return air tickets and inquire about anything about air tickets. You can get to Kunming (kūn míng 昆明) first by air, and then go to Qujing by bus. The transportation in Qujing is very convenient. The two electrized railroads of Guizhou-Kunming, Nanjing-Kunming go through the 8 counties and cities of Qujing. The Guizhou-Kunming railroad goes through Malong, Qilin Region and Xuanwei. The Nanning-Kunming railroad goes through such counties as Luoping, Shizong and Luliang. Kunming-Qujing Station: the travel from Kunming to Qujing lasts for about 2 hours and 40 minutes. The price for the hard seats is 10 to 25 yuan. In the station there are many other trains going to Guiyang (guì yáng 贵阳), Shanghai (shàng hǎi 上海), Beijing (běi jīng 北京), Chongqing (zhòng qìng 重庆) and Zhengzhou (zhèng zhōu 郑州). Kunming-Xuanwei Station: the travel from Kunming to Xuanwei lasts for about 4 hours and 30 minutes. The price for the hard seats ranges from 19 to 42 yuan. In the station there are many other trains going to Guiyang, Shanghai, Beijing, Chongqing and Zhengzhou. Kunming-Luoping Station: the travel from Kunming to Luoping lasts for about 4 to 6 hours. The price ranges form 16 to 33 yuan. In the station there are many other trains going to Guangzhou (guǎng zhōu 广州), Nanning (nán níng 南宁), Zhanjiang (zhàn jiāng 湛江) and Hongguo (hóng guǒ 红果). Highways in Qujing area go to all directions. The two superhighways, Kunming-Qujing and Qujing - Luliang, and the national highways such as No.213, 320, 324 and 326 go through the city. The National Highway No. 323 connects the highways from Kunming to Baise (bǎi sè 百色). 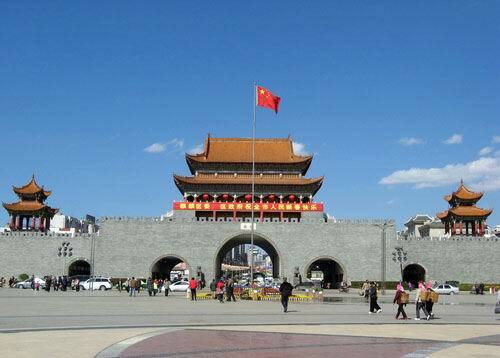 Kunming-Qujing City (or Qilin City): the Kunming-Qujing Superhighway is 145 kilometers long. The travel lasts for two hours and a half. The price for minibuses is 20 yuan, and the price for the expresses is 36 yuan. Passenger buses are available in every large bus passenger transportation station. Kunming-Luoping: the highway is 240 kilometers long. The price is 32 yuan. Buses are available in every hour in Dongju Passenger Transportation Station. Kunming-Zhanyi: the highway is 155 kilometers long. The price is about 25 yuan. Buses are available every day in Yunnan Tourist Passenger Transportation Station. Kunming-Huize: the highway is 259 kilometers long. The price is more than 40 yuan. Buses are available every day in Yunnan Tourist Passenger Transportation Station. Kunming-Xuanwei: the highway is 248 kilometers long. The price ranges from 30 to 40 yuan. Buses are available every day in Yunnan Tourist Passenger Transportation Station. Qujing-Luoping: the highway is 133 kilometers long. There are 8 major bus routes in the city proper of Qujing. The 8 routes cover all the main Hotels , restaurants, shopping centers and recreation grounds of the city. Within the city, the starting price of the taxi is 5 yuan. It is 7 yuan after 9 at night. Spring (March to May): one or two sweaters; velveteen; trousers; one or two coats. Summer (June to July): thin overclothes; one or two shirts; short-sleeved T-shirt; suit. Autumn (August to November): one or two sweaters; velveteen; one or two coats; trousers; shirt; jacket. Winter (December to February): one or two sweaters; velveteen; one or two coats; woollen trousers.